October is a beautiful time to enjoy Wichita’s fall weather and the largest city in Kansas’ long list of uniquely autumn events and activities. Find a Halloween event for children, adults or both; take in a classic horror flick at our historic theater; boo the villain at a locally-produced, holiday-themed melodrama; attend a family-friendly craft workshop or shop at a craft fair; attend the new ICT Bloktoberfest – a one-block festival taking place around Union Station. Ready to fill your October calendar? Take a look at this list of events we’ve curated. Mosley Street Melodrama presents Frank N Stein or Another Creature Feature written by Dr. Thom Rosenberg, Robert L. Jennings and Tom Frye and directed by Frye. Enter the world of Dr. Frank and Dr. Stein as they work to create unspeakable creatures. This hysterical melodrama is full of Halloween fun and things that go bump in the night. The show is rated PG-13 for mild innuendo. Following intermission, enjoy a musical revue, featuring your favorite hits from the disco era performed by a cast of the undead. Performances are Thursday, Friday and Saturday evenings through Oct. 29. Dinner from Pig In Pig Out BBQ is served from 6:15 to 7:30 p.m.; show begins at 7:50 p.m. Tickets are $30 for adults, $26 for 60 or older and 12 and under. This is a free and self-guided tour of ghost stories behind one of Wichita’s oldest neighborhoods. From 6 to 9 p.m. on Oct. 6, stop by one of these Delano businesses and pick up a guide: Lawrence-Dumont Stadium, Downtown Senior Center, Amira&apos;s Dance Productions and Delano BBQ. Follow the guide to learn the ghost stories; transportation is on your own. While in Delano, check out the district’s unique shops, art galleries and restaurants. Wichita’s first Bloktoberfest is scheduled for noon to 11 p.m. on Oct. 8 at the newly-renovated plaza outside Union Station, and along the street between the station and the Rock Island Depot. Organizers are planning traditional Oktoberfest activities like seasonal beer tastings, live music, adult yard games and food, including a sausage contest with local businesses competing for the crown of King Weiner. Look for many other contests, too, from a hot dog eating challenge to a beer belly contest to a friendly battle of the local beer brewers. The event is free, however there are fees for beer and sausage sampling. 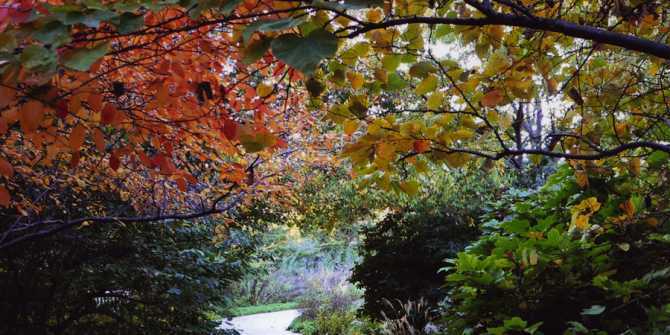 From 11 a.m. to 4 p.m. on Oct. 8, Wichita’s botanical gardens are full of non-spooky, Halloween-themed activities for children and families. There will be games, hands-on art projects, live performances, shows, live animals and other activities. Admission is $8 for the public. This 21-and-over event at Wichita’s interactive science museum is back by popular demand from 7 to 11 p.m. on Friday, Oct. 14. Exploration Place invites you to the “Institute” where they are trying to find a cure for those infected by the ZMB1 virus. Join the investigation into how mutagens and contagious disease affect our genes. While you&apos;re there: putt-putt through a human cell and attempt a nucleus-in-one, fire a canon at zombies using beer goggles, encounter a zombie dissection, throw DNA into a cup of chemical solution with Pathogen Pong, play Twister with your personal DNA code and complete a Genome scavenger hunt and win a prize. Casual or apocalyptic attire encouraged. Advance tickets are $15, $20/member and $25/non-member on the day of the event. If you haven’t been out to this unique spot where you can watch planes take off and land literally feet from your table, you won’t want to miss this event! Last year, 800 to 1,000 folks came out to see 13 aircraft compete in the pumpkin drop: pilots dropping pumpkins from their aircraft as they fly over Lloyd Stearman Field Airport. Closest to the target on the ground wins the trophy! Festivities start at 2 p.m. with the pumpkin drop and a children’s costume contest. At 7 p.m., local band Remedy takes the stage and an adult costume contest takes place about 10 p.m. A limited food and drink menu is available at Stearman Field Bar & Grill throughout the event. Activities are free for spectators. Catch the 40th anniversary screening of the 1976 American supernatural horror film Carrie at Wichita’s historic Orpheum Theatre. Doors open at 6 p.m. and the film starts at 7 p.m. on Oct. 20. Tickets are $4 to $5 per person. Pumpkins at the Park is one of the biggest annual events at Tanganyika Wildlife Park, which has 300 animals on exhibit and attracts 100,000 visitors every year. They create a fun and freaky festival with activities for children, teens and adults. The entire Pumpkin Trail is full activities for younger children: trick-or-treat stations, inflatables, crafts, games, performers, characters, creepy-crawler encounters and a funny science show. Teens will enjoy the trick-or-treating and they’ll also want to catch the shows, the 3D haunted house, a creepy cage maze and paintball (extra fee, ages 12 and older only). Adults can enjoy all the activities and also get drinks at two bars inside the park. Pumpkins at the Park is from 6 to 9 p.m. each evening and costs $12 for adults; $6 for children 2 & under; free for 1 & under. The University United Methodist Church is hosting a Fall Artisan Festival from 9 a.m. to 4 p.m. on Saturday, Oct. 22, at 2220 N. Yale Ave. Artists and crafters from Wichita and surrounding areas will have their handmade/handcrafted merchandise available for purchase. More than 40 booths will be set up and will include pottery, woodcrafts, drawings, paintings, jewelry, terrariums, soaps, hair accessories, greeting cards, apparel, blown glass and sculpture. Admission is free; lunch and snacks will be available for purchase. Proceeds from this event will go toward local mission projects. Exploration Place’s spooktacular fun for kids takes place during regular hours on Oct. 22-23 and is included with museum admission. Wear your favorite Halloween costume and scare up some ghostly fun with ooey-gooey experiments and activities. This new 21-and-up event is an outdoor screening of the movie “Halloween” in Botanica’s Children’s Garden Meadow. Fright Night starts at 7 p.m. and the $25 ticket includes a brat, chips, popcorn, s’mores and a haunted walk through the gardens. Guests can bring other snacks and adult beverages. No lawn chairs are allowed but bring a blanket or borrow one of Botanica’s 300 Coleman outdoor blankets. No October is complete without a screening of the horror parody Rocky Horror Picture Show, and Wichita’s historic Orpheum Theatre is the perfect venue for the campy film. Doors open at 10:30 p.m. for the midnight screening on Friday, Oct. 28. Tickets are $10 per person; participation kits are $5 and advanced purchase is recommended. Anyone under 17 must be accompanied by an adult. Everyone is welcome to come dressed as Brad, Janet, Frankie or your favorite Transylvanian! Bring your ghouls and goblins for a night of not-too-scary Halloween fun at the Sedgwick County Zoo, the seventh-largest zoo in the country and the state’s most-visited outdoor attraction. You can wander the zoo at your leisure, visiting Dracula and the fortune tellers, playing fun Halloween games like pumpkin bowling and beanbag toss, seeing jack-o-lantern displays and visiting Candy Land on your way out. You might see animals in their outdoor exhibits, but most animals will not be in attendance at this event. Night of the Living Zoo is open 6:30 to 8:30 Friday, Saturday and Sunday. Advance admission is $7; at the gate, admission is $9. Children 2 & under are free. For two evenings, the streets and buildings at Old Cowtown Museum transform for A Night of Hay, Hooves and Halloween. Instead of a gunfight between cowboys, you could get caught in the middle of a zombie gunfight on Main Street! Admission to the living history museum is $5 per person from 4 to 8 p.m. on Oct. 29 and 30. Costumes are encouraged and you can trick-or-treat among the 54 historic and recreated buildings that help tell the story of what life was like just off the Chisholm Trail during the 1865-1880 timeframe. Activity stations will offer candy and games with Cowtown’s ghostly friends. There will be dancing, meet-and-greet opportunities with well-known storybook characters such as the Headless Horseman, pumpkin bowling and carnival games. Fall Frenzy is a free family-friendly art workshop from 10 a.m. to 2 p.m. on Oct. 29 at CityArts in downtown Wichita. Participants will work on various fall and Halloween-themed art projects, snack on tasty treats and trick-or-treat for candy. Costumes for adults and children are encouraged. Dress for Success Wichita&apos;s 15th annual Boo & Brew Ball, for which proceeds directly benefit women looking to re-enter the workforce and become financially self-sufficient, is 8 p.m. to midnight on Saturday, Oct. 29. This year’s event will have a Hollywood glam theme and will feature live music by Annie Up, contests, heavy hors d’oeuvres and adult beverages, live and silent auctions, an opportunity to take part in an exclusive giveaway for a pair of diamond earrings and a whiskey pull that enters guests for a raffle. Tickets are $75 per person.